In the beginning of September, 1936, members of the U.S. Army 99th Bombardment Squadron came to Hillsgrove Airport for two weeks of training. On the evening of September 21st, three B-10 Bombers took off a night training mission. Shortly afterwards, heavy fog settled over the area, and when the planes returned the pilots were given instructions via radio on how to land. 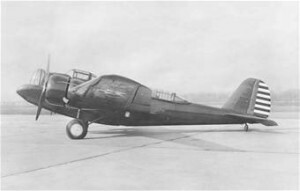 The first bomber to attempt a landing overshot the runway, and according to witnesses, its wheels almost touched down before the pilot gunned the engines for another attempt. Due to the heavy fog, the pilot evidently didn’t realize how close he was to the end of the runway, and the plane plowed into a patch of woods, broke apart, and caught fire. All three crewmen aboard died as a result of the crash. The other two planes left the area and landed at Boston and Albany, New York. City of Providence, R. I. death records. City of Warwick, R.I. death records.